How can a Card-to-Pocket routine so easy to perform be so powerful? Considering the economy of method, the impact that Backlash 2 can have is way out of proportion. For very little dirty work, you get a powerful punching routine. But that's because most of the dirty work is in the mind - and without anyone needing to think dirty or naughty thoughts! 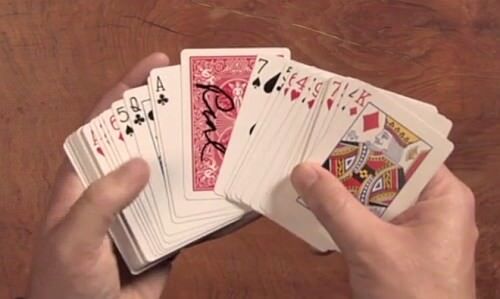 With the help of some psychology and careful patter, this trick gives you the opportunity to create a real miracle, plus give your spectator a personalized souvenir at the same time. As the ad copy rightly promises, it really is easy to do, because there's no difficult sleight of hand. Paul Harris' Backlash effect was first published in Volume 1 of his three volume book series Art of Astonishment. Backlash 2 is an updated and streamlined version of the original routine, as a result of the involvement of Bro Gilbert. The revised version was first released as part of the True Astonishments Boxed DVD set, but is now being made available to us for the first time as a separate digital download courtesy of The Vault series from Bro Gilbert. "A playing card is clearly signed on both sides by your spectator. They push their signed card into your pocket themselves... Without you ever going near your pocket, you show that it has in fact never left the deck... they confirm that the card in the deck is indeed their original signed card that they pushed into your pocket themselves moments ago! Just as suddenly the signed card vanishes from the deck and appears back inside your pocket. You now show their signed card on both sides and shake it gently in front of their eyes... mouths drop when they see their signature slowly morph into yours! You can now hand the card out as a souvenir to remind them of your astonishing interaction. " From the perspective of your spectator, that's exactly what happens. The first mystery happens when the signed card they pushed into your pocket suddenly shows up in the deck. Then they're hit again, as it vanishes. The final miracle is the most visual one of all: their signature visually changes into your signature, right in front of their very eyes! I can't comment on how Backlash 2 compares with the original Backlash as published in the Paul Harris Art of Astonishment book, but I have read that the original involved some spelling, and certainly the revised version dispenses with any of that. What you get for around $10 is an instant digital download of the video, which demonstrates and teaches the routine. You can play the video via streaming, or download it in *.mp4 format to view on your computer with any video program. The entire video is just over 8 minutes long, and the downloaded file is about 260MB in total size. So what you get is in high resolution and very clear. I had no problem following any of the instructions given in the explanation. 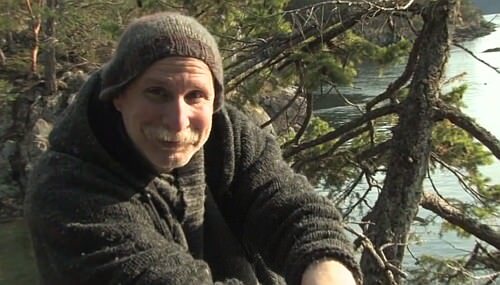 As with the other Paul Harris videos taken from the Art of Astonishment video series, the main teaching section consists entirely of a visual explanation, with written text on the screen providing the instructions. This method would hardly be ideal for a complicated trick, but fortunately the actual method of this trick is very straight forward. That's why there's no difficulty whatsoever in teaching the entire routine like this in four minutes flat, without a word ever being spoken! That doesn't mean that you don't get to hear Paul Harris talking at all. In fact, the first half of the video features an intimate heart-to-heart conversation with Paul. It's a one-sided conversation, admittedly, because he does all the talking, and we just listen! But it's just as if he's sitting down with us in a serene setting in the great outdoors, as a friendly and fatherly figure from the magic world, giving us wise advice and helpful tips about how best to perform this routine. Much of what he says here is in fact essential, because this routine needs to be set up very carefully in your spectator's mind, and Paul has some very important suggestions to make about how to accomplish that. The mechanics of this trick are just as straight forward as they promise to be. Aside from needing to remember how to do all the moves (which isn't rocket science by any means), if you can perform basic sleights like a DL and get a break, you've got the kind of card skills that this routine will demand of you. As Paul explains, it's a powerful trick that is a real lesson in making a lot out of a small amount of actual work. The real challenge here, however, is psychological, and that shouldn't be underestimated. As Paul emphasizes in his introductory segment (PHoote Notes), you need to establish in your spectator's mind a number of important things very clearly, and it's critical to be slow, deliberate, and clear before the apparent magic happens. So the early phases of this routine can't be rushed, and there's some interesting psychology at work which is key to this routine working as well as it does. Paul Harris assures us that that even for a couple of elements in the routine where a magician might expect to get "caught", this has never happened in all his many experiences with this in the real world. Bro Gilbert tells me that he has personally performed this hundreds of times, and had the same experience. To share in this success, however, you will need to perform it correctly. If you set up the trick carefully and correctly, and cement things strongly in your spectator's mind, they have no reason to even question some of the assumptions they'll be making later on, because they have observed things previously, and this becomes a rock solid assumption going forward. Will they notice any discrepancies, and connect the dots to uncover the secret? Not if you do your job properly as a magician, by mastering the routine well enough with appropriate patter and presentation to ensure a positive reaction of astonishment. All the heat is on the card they hold in their hand at the very end, and because that is completely examinable, it's too late for them to reconstruct the miracle, or view it differently. As always, never perform the same effect twice to the same group, and that's especially true with this routine! This is one of those routines that you really just need to try for yourself to see how powerful it is. When you watch the explanation, there's a couple of things that might cause you to question whether it can really be pulled off. After all, won't the apparent "discrepancies" get noticed? Even watching video trailer doesn't show the true potential of the routine, because the trailer doesn't really put you in the shoes of the spectator, and doesn't show you first-hand what is going on in the final phase of the trick, as one signature morphs into another. But don't make the mistake of many beginners who underestimate or dismiss this routine for this reason, once they know the secret. Those who have had the guts to try this routine, report that they have found it surprisingly strong, and consistently successful. 3. When their signature visually changes. It seems to me that the second moment is the weakest of the three, and that is when you are going to be most vulnerable. But overall there's a nice progression, culminating in that very visual transformation at the end. Does this the final kicker with transforming signature add too much, and tip the method perhaps? Yet without this phase the routine would seem to lose too much, and have too many loose ends, and when done well, this final moment is really the moment of greatest surprise. I wonder whether it could make people question whether their signature was ever on the card in the first place, and help them connect the dots of what has happened previously. But these considerations just emphasize the need for cementing your spectators' assumptions in concrete in the first part of the routine, so they have absolutely no doubt that what they see going into your pocket is a card with their signature on both sides. So the final phase is very visual, and can involve a challenge to succeed, but when the psychological preparation has cemented the right images in your spectator's mind in advance, it can also be the most mind-blowing. One of the real strengths of this routine is how much it accomplishes for very little sleight of hand. 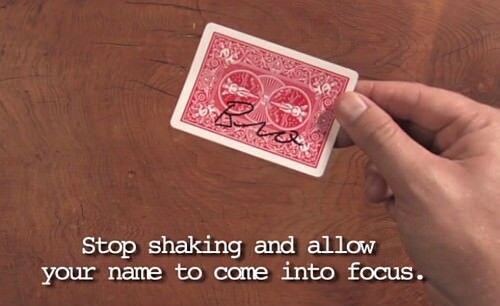 The actual "moves" you need to perform the magic are very few and are very elementary. Yet despite this, a lot of magic appears to happen, in fact proportionally far more than what you'd normally get for such little effort. Real effort, however, does need to go into presentation. 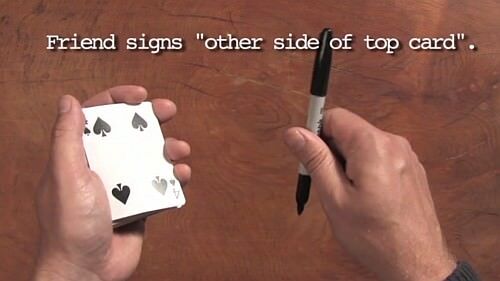 Since the psychological element is so important, and the magic is based on your spectator's assumptions, you shouldn't overlook how important it is to get this element of the trick right. Don't rush things, and make sure everything is very clear in your spectator's mind before proceeding to the critical phases. Paul Harris gives some valuable tips on this. While clarity rather than confusion is essential with all magic, it's the case with this routine even more than most. The performances by Bro Gilbert that are shown on the video trailer are also worth learning from here, because the pseudo-hypnotic presentation he uses really helps sell the overall effect. In his patter, he cleverly suggests that the spectators are merely being hypnotised to think that the card is in the deck instead of his pocket, and that what happens next is a product of their imagination. This also gives a sound motivation for the apparent discrepancies about how a card can be in two places at once. One final element that deserves mention is that your spectator gets to take a card home with them. As a result, performing this routine multiple times for different spectator will eat into your deck a card or two at a time. But being able to give your spectator a personalized souvenir is one bonus result of this. Despite the praise, and despite the assurances of success from Paul Harris and Bro Gilbert, there are also those who are suspicious of the discrepancies, and aren't confident enough to give this trick a whirl in the real world. The requirements for a good presentation do appear to have scared some people off, so you will also find mixed reviews of this routine. However I suspect that many of the negative comments are actually from those who didn't venture to try the routine in the first place, because they were convinced it was doomed to failure. It does deserve a chance, and until now I haven't come across a single report from anyone who has actually have tried Backlash 2 and found that it didn't work for them. Backlash 2 doesn't appear to have generated quite the same level of response as some of the other routines from the True Astonishment series. I haven't seen any evidence that suggests that this is actually because it is flawed or weaker than other routines. Rather, it seems to me that some magicians realize that this routine can be somewhat demanding in terms of its presentation and psychology, and the element of "risk" simply makes them reluctant to try it. In the end, it is a personal decision whether you feel comfortable with the presentation this routine demands, whether you think it suits your style, and whether you can pull it off. Given the minimal card skills demanded by Backlash 2, and its implicit potential, I'd encourage people to at least give it a chance. Just be sure to work carefully on the presentation, and only start performing it when you have that down pat. Your success may be far greater than you expect, and the reactions you get may be far stronger than you think! In other words, Backlash 2 could just prove to be a surprise even for the magician himself. Now isn't that true magic? !